This morning thanks to Paul McNeil & CBC's Island Morning, I was a featured guest on the segment "On The Line". Didn't hear it? Click here to listen. A couple questions have been asked since the phone in and I figured I would write a blog post to follow up. The GPS tracking device. I spoke about Google Latitude which allows friends to track one another. I blogged about this last year and followed it up with an update. I am not aware of any mobile software available that will allow you to track someones position without their approval. For instance, I mentioned I could lookup where my sister is at any given moment. I had to add her, and she had to approve me access, as a Google Latitude friend before I could see her position. 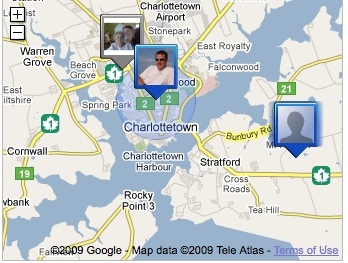 Here's an example (my sister being the profile photo in above my location in Charlottetown). Secondly, just because a website is secure (you see https:// in the address bar or the lock) does not mean it is legitimate. Criminals can sign up for secure certificates as well. There is no rigorous process to obtaining one. It's simple, pay your money and you can have a secure website. That's all for listening. From conversations today either a lot of people have their radio stations set to CBC Radio for their alarm clock or a lot of people tuned in to hear it.